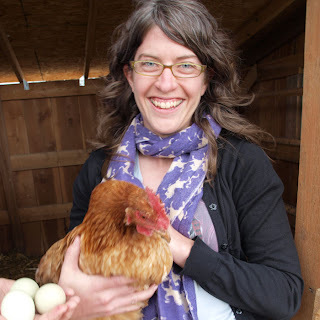 Jaime and I just got back from a whirlwind tour of Norwood, Colorado fiber farms. 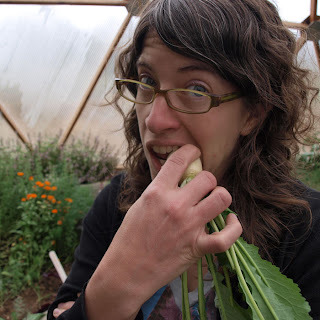 We had so much fun getting nuzzled by soft goat lips, hugging baby animals, getting cuddled by sweet horses, munching on organic turnips and getting our relaxation on in hot mineral springs and vapor caves. So much fun that it is going to take several posts to share all the fun. 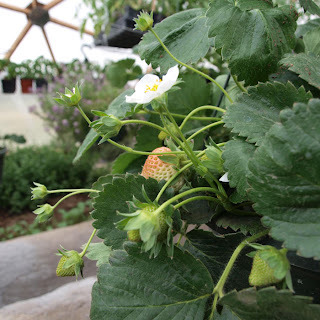 But before I tell you about the fiber farms, first let's start with our visit to Buckhorn Gardens, an organic farm outside of Montrose, Colorado. It was totally amaaazing! 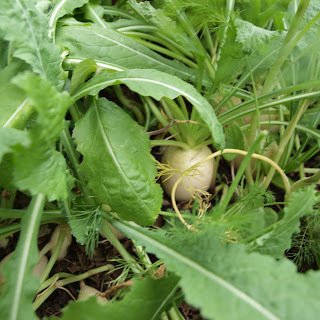 My mom, Suzan, is a part of their CSA and enjoys farm fresh eggs and tasty vegetables grown in their greenhouse. 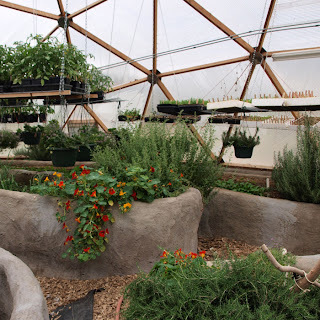 She took us on a tour of the geo-dome greenhouse. 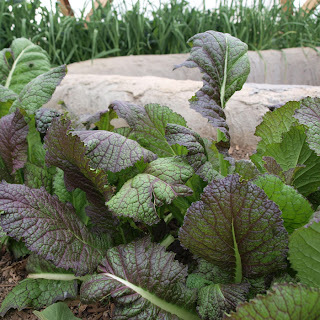 We had to taste test a few things, like tiny nasturtuim leaves that taste like pepper, sweet turnips hiding under greens, and some kind of purple leafy green that tastes like wasabi. 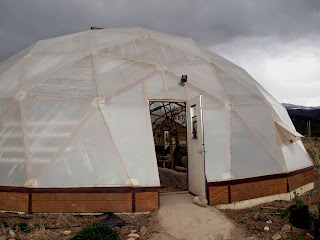 We fell completely in love with the greenhouse dome and wish we could build one in our neighborhood. Does anyone in Baker have an empty lot? 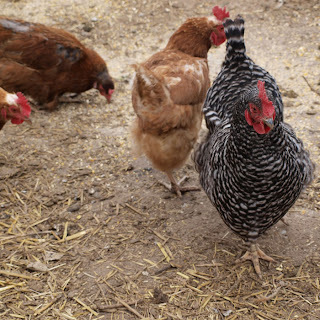 We also visited the chickens while we were there. What cuties! They were friendly little chickies and Jaime even cuddled one while we checked out their colorful eggs. 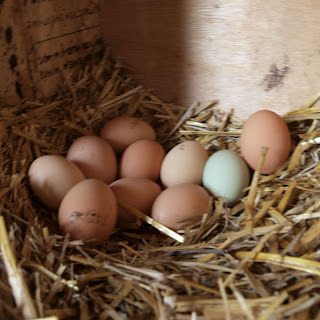 Mom picked up a dozen for us to taste test later and we left some money in the jar for the farmers. After our farm visit we took a trip to Weisbaden Hot Springs in Ouray to relax in the vapor caves and natural hot mineral springs. When you go into the cave there is this little waterfall room which leads to a little old wooden door in the rock. Through the door is the steamy vapor room with a hot springs pool. OMG. I've never been so relaxed. We were too relaxed to snap any photos--I'm not sure we could have in that super steamy environment--but the cave was unbelievable. Ok, my next post will have furry animals, I promise. 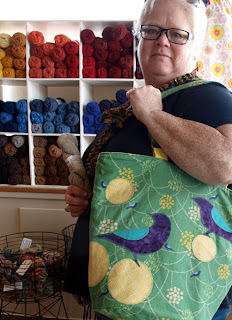 This lovely lady came in the other day with a bag she had sewn from some of our Japanese Echino fabric. 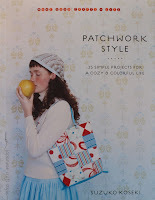 We love the way she appliqued birds and yellow dots onto her bag, mimicking the fabric's cute pattern. Sweet! 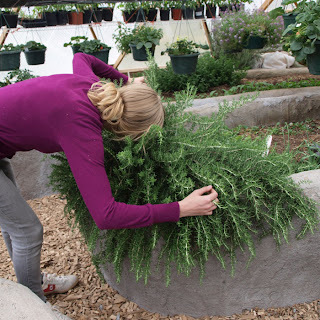 1) Tell us about the project you've made. What pattern and materials did you use? 2) Tell us something about the person who taught you to do what you do. My mother continues to inspire me every day, however, many wonderful women have taught and inspired me. 3) What is your favorite animal? 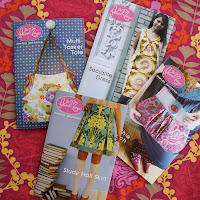 New and adorable at Fancy Tiger Crafts--Modkids sewing patterns by Patty Young. 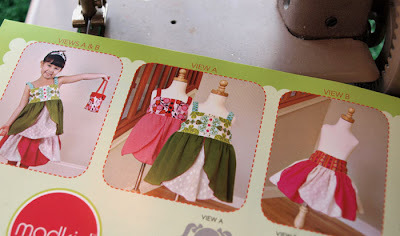 These patterns include sizes 2T - 7 for fancy little cutiepies! 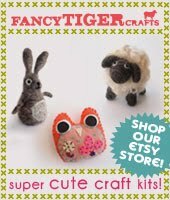 Here is a super cute, quick project perfect for felt scraps. 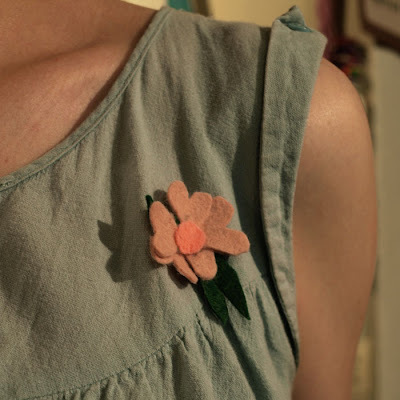 A fancy felt flower pin! Make one for your best friend and she'll love you forever. Make one for your worst enemy and you'll have a new best friend! 1) Cut five cute hearts out of your petal felt. They should be about 1" high. 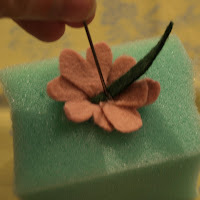 Cut out a few green slivers about 1-1/2" long for leaves and a 1/2" circle for the flower's center. 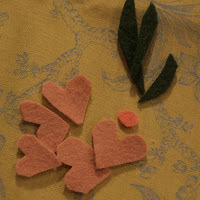 2) Overlap all the hearts' points and needle felt them together where they overlap. Be gentle with your pokes so you don't bend or snap your needle. 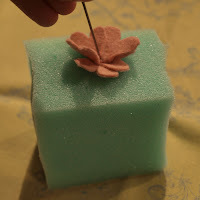 3) Place the leaves on the back of your flower and poke with the needle to join. 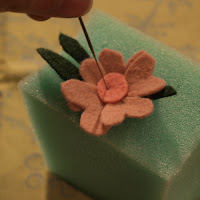 4) Needlefelt the circle onto the front center of your flower. 5) You can hot glue or sew your flower to a pin back or barrette, or carefully straight pin it onto your lapel like the olden-days! We are so excited about tons of new books. Tons! Here is a peak of some of the newest and craftiest and hot-off-the-press craft books. These super cute little books were originally published in Japanese. They were just published for the first time in English. Sweet! Now you can get super hot Japanese craft style without having to learn Japanese! I love knitting socks from the toe up, but finding cute patterns is not so easy. So, I'm really excited about this Socks From The Toe Up by Wendy Johnson. If I can nerd out for just a bit--I mean this is kind of amazing--this book has awesome instructions with diagrams for five different seamless cast-ons, three types of heels and three stretchy bind-offs for comfy fit. 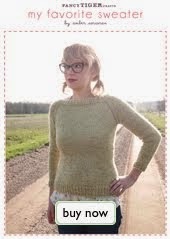 She goes over for knitting socks on double points, on two circulars as well as with the magic loop method. PLUS, there are tons of cute sock patterns. Dang. This book is super sweet. 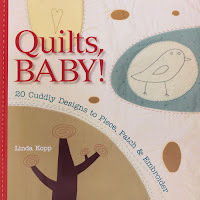 These quilts are adorable. Super adorable. 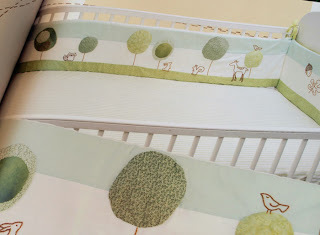 We are in love with the baby bumper embroidered with woodland creatures. 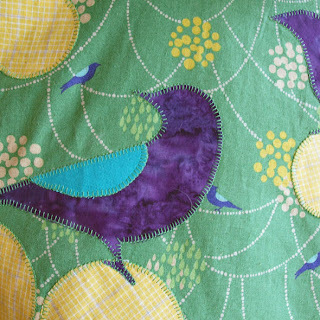 There are tons of modern quilt patterns simple enough for a beginner quilter. I kinda want to make myself one in grown-up size. This may be the manliest crafting book ever. I mean, there is a chapter titled Axe Craft. Perhaps you'd like to make your lady a log cabin birdhouse with your axe? Or maybe she'd prefer some handcrafted dinnerware hammered from tin cans? No problem. 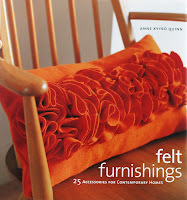 The sewing patterns in Felt Furnishings are modern and minimal, but oh so warm and cozy. The projects include tons of awesome throw pillows, blankets and lampshades, table linens and house slippers. The sculptural designs really show off the unique properties of working with felt. Wondering where to get felt? We've got loads of pretty colors of felt by the yard in the store and more are arriving this week! Well, those are some of the tons of new books. But, seriously, we got tons so come in and check out all the excitement. 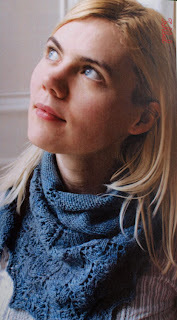 Our favorite Scottish knitting designer, Ysolda Teague, just published her first book! 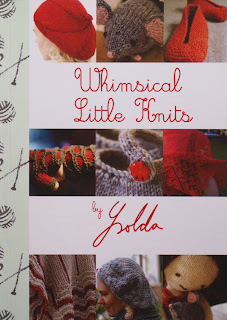 It is filled with super cute patterns for everything from lovely lace projects like the Ishbel Scarf (see Molly's version on our recent Better Know A Crafter post) to super cute toys, adorable knit slippers and Ysolda's signature berets. 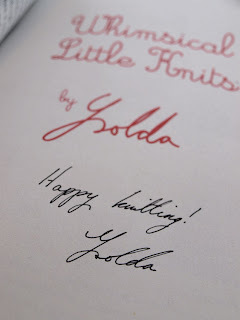 We special ordered these hard to find books from Ysolda herself and the lovely lady signed every one of them, making them even more extra special. 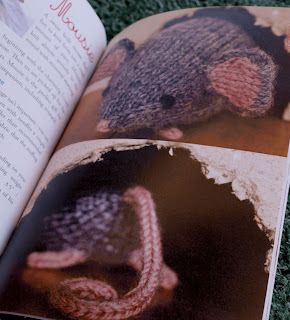 Omg, can you believe how cute Mousie is? Cute! 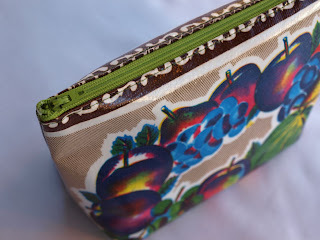 Here is an idea for a quick and cute project--a simple oilcloth pouch to hold all your goodies. Oilcloth is pretty awesome. It's waterproof, dirt proof, and easy to sew. 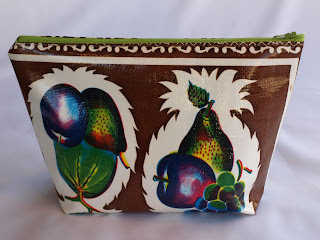 This little zippered bag is perfect for craft supplies, art supplies or a re-usable snack pouch. Cut the oilcloth into two 13" x 10" rectangles. Centering the zipper along 13" edge of one piece of oilcoth, sew zipper in place. Your oilcloth should extend past the zipper stops (little metal thingies) about 1/2" on either side. Repeat with second piece of oilcoth for other side of your zipper. 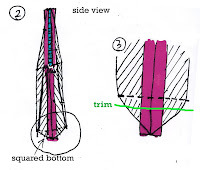 Folding at zipper, put right sides together. Using 1/2" seam allowance, stitch around sides and bottom of bag. Be careful not to hit any of your zipper with your sewing machine needle. This is super easy, but hard to describe, so how about some diagrams? Click on the diagram to enlarge it. Right sides together. Pinch together side seam and bottom seam, lining them up and flattening the bottom corner. 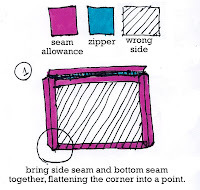 Mark a line perpendicular to the seam 1-1/2" from point of corner. Stitch corner flat along line. Trim to 1/2 from seam. Now unzip your zipper and turn the bag right side out. Nice work! What a perfect little easy gift. Come by Fancy Tiger Crafts and check out all the cute summery oilcloth we have in right now! Zer is one of our lovely craft night regulars. 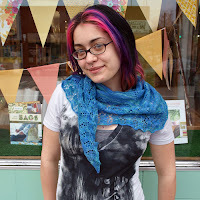 She knits, crochets, cross-stitches and sews, and has been stitching up some pretty cute aprons lately. 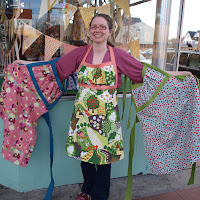 Sew Liberated Emmeline Apron. 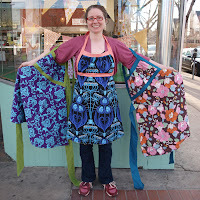 I used all fabrics from Fancy Tiger--Prairie Gothic, Japanese and Jay McCarroll prints. My mom sewed a lot when I was young. She used to make Barbie clothes & matching dresses for me. 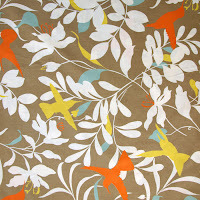 Just in--a new line of sophisticated botanical inspired prints in a lovely muted palette by Sanea. So soft and pretty! This fun weekend handsewing project will use up some of your fabric scraps and turn a simple mason jar into a cute and craftastic travel beverage carrier. 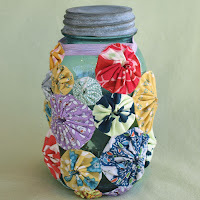 If you don't have a lot of fabric scraps you can also use a couple of fat quarter bundles. 1) Make your yo-yos. The number will depend on how big your yo-yos and your jar are. Mine took about 25 yo-yos. Cut circles out of your scraps about twice as wide as you want your finished yo-yo. You can trace around a small dish or a cup to mark your fabric. I like to make mine all different sizes. Fold in the edge of your fabric about 1/4" as you run a basting stitch around the edge of your circle, about 1/8" from the edge. When you have gone all the way around, pull the thread to gather your yo-yo together. Measure around your mason jar. Begin sewing your yo-yos together in a strip that is as long as your jar measures around. Sew this strip into a ring. 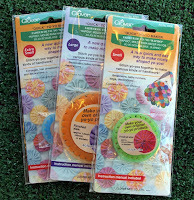 Now pick some yo-yos for the bottom of your cozy and sew those together and attach them to the bottom. Add more yo-yos for the sides of the cozy until they reach the neck of your jar. 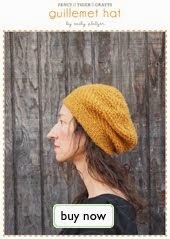 Cut a length of elastic that fits around the neck of the jar and overlaps 1/2". Stitch the overlapped ends together to make an elastic band. Stitch the yo-yos at the neck of your jar to your elastic band. Now you can drink on the go with super-crafty style! simple and speed up yo-yo making! Ishbel by Ysolda, large shawl size. 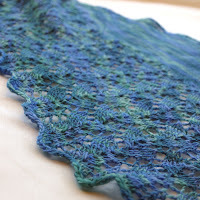 I used one skein of Malabrigo Lace, colorway Emerald Blue. I learned a lot of lace techniques form Cindy Fite, a wonderfully patient teacher with a wealth of knitting knowledge! 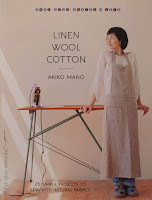 We've been holding our breath for the arrival of the new Anna Maria Horner sewing patterns. We've just unpacked them and the projects are as cute as can be. 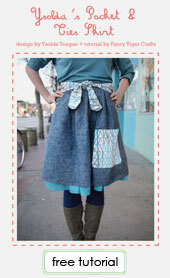 We can't wait to get started on some springtime sewing!